Home / New Machines / Rotary Floor Scrubbers and Polishers / Tomcat Edge ISO “Stick” surface preparation machine. The NEW and truly versatile Tomcat Edge ISO “stick” machine makes short work of floor scrubbing, chemical-free stripping, grout cleaning, sanding, grinding and polishing. The versatile ISO stick is faster than traditional methods, with the added advantage of cleaning right up to the edge and into the corners. Uses up to 70% less water and chemicals, better for the environment & safer for the operator. The Tomcat ISO orbital machine is unlike other orbital machines due to its extremely powerful electric motor, adjustable head weight and high oscillating speed with a working width of 20” (500 mm). Seeing is believing, you are welcome to visit our shop in Wallingford, Oxfordshire, or we can come to you and put the Tomcat ISO through its paces. We are proud to have the new and totally awesome Tomcat EDGE floor preparation and finishing machines on our hire fleet and you are welcome to hire one of our machines for a day or a week to give it a try before you buy, (available to local customers ). If you decide to buy we will refund the hire charge ! Please do not hesitate to call us and reserve one of our machines. The Edge Stick with the rectangular high speed oscillating system offers a new concept in floor cleaning and preparation. The combination of a unique high speed orbital motion and a large range of cleaning pads, screens and specially developed tools make the EDGE ideal for cleaning and renovation of hard floors. For special applications additional weights can be added, increasing the machine operating weight up to 120 Kg pressure. The orbital action creates a more even finish than traditional rotary machines, taking less time to achieve superior results. The EDGE stick can be used for chemical-free stripping multiple layers of polish from linoleum, PVC, rubber and other hard floors. 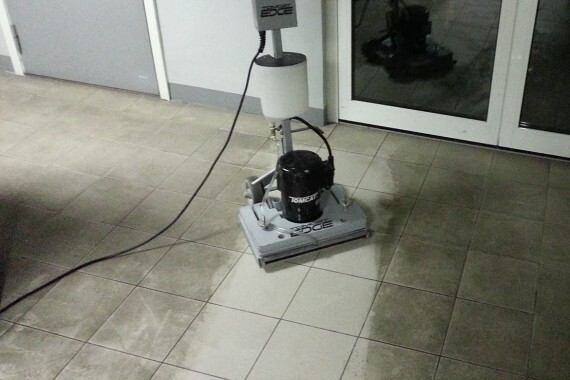 Diamond polishing natural stone floors is a simple task, with a range of specially developed pads & resin tooling. Sand wood floors virtually dust free with the vacuum attachment, safer and easier to use than a drum or belt sander and sands right to the edge and into the corners. Clean ceramic tiles and even the grout with our unique pads and tools. The orbital action gives a more even finish than traditional rotary machines, taking less time to achieve superior results . 6 in 1 machine: scrubber, grinder, sander, edger and polisher. Ideal for all wood floors including parquet, laminated, veneered and solid. Excellent results when used on stone, ceramic, vinyl, resin and safety flooring.